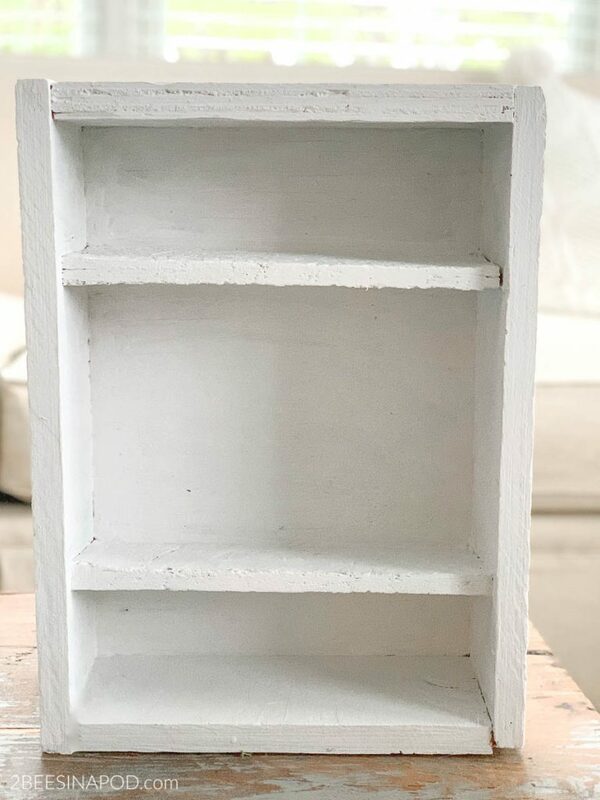 A painted shelf makeover, by way of a free item from the thrift store. Every month I look forward to our Thrifty Style Team post. Personally, I love to see what I can create for as little money as possible. For me it’s a personal challenge. When I see what the other team members create each month, I am truly awestruck. Each designer has such wonderful ideas. Don’t forget to visit their links at the end of this post. My project this time around is super easy. 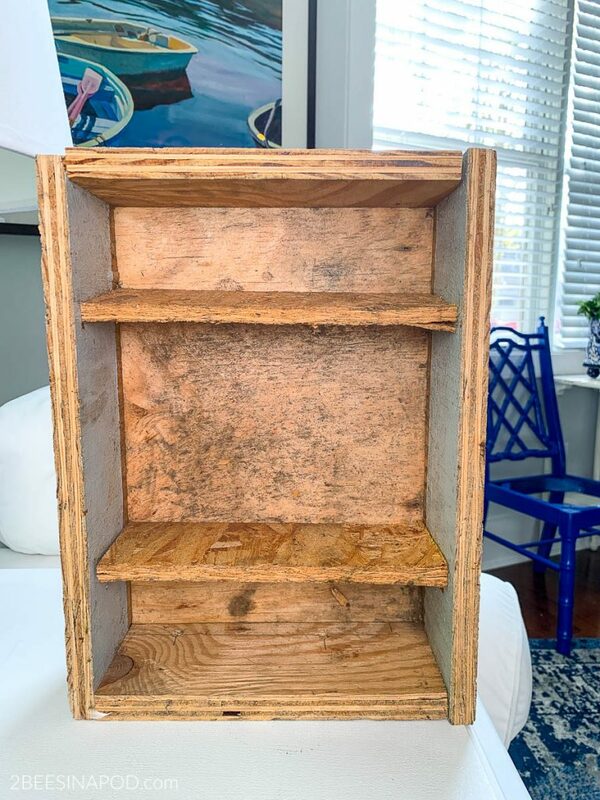 Can you believe that I got this wooden box shelf-thingy at a thrift store – for FREE? Admittedly this might have been one for the burn pile. LOL It was filthy, covered in dirt and cobwebs. My best guess is that this was handmade and used on a construction site. Possibly it held bits and bobs of washers, nuts, bolts and screws. In reality, I have no idea what this box is. The shelves or dividers are made of particle board. I gave the entire piece a very good clean. As you can imagine, it took a bit of elbow grease. 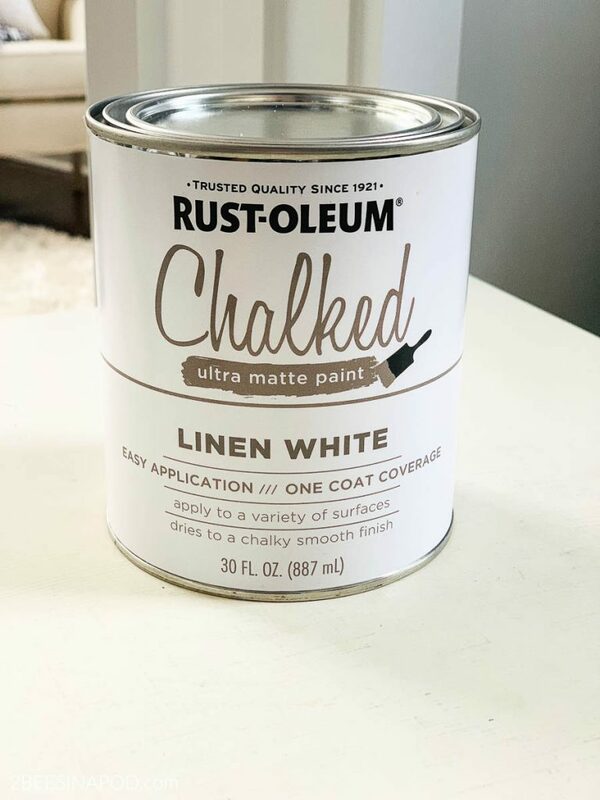 Next, I painted two coats of Rustoleum Chalked paint in Linen White. You can find this paint HERE. Better already, right? I still wanted to keep the rustic look and feel of the shelves, so I just painted in quick strokes. Nothing too refined or perfect here. Doing a quick staging, I settled on my favorite blue and white combination. 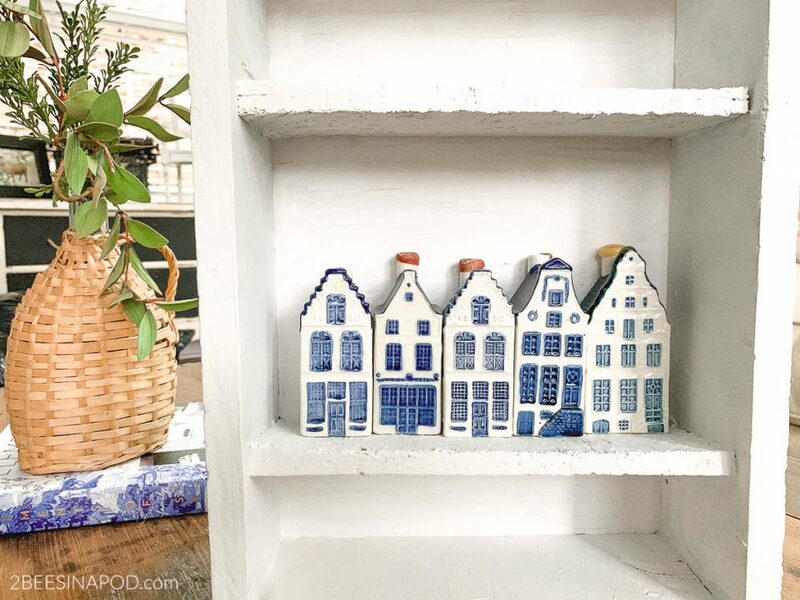 These adorable delft houses are vintage KLM Airlines liquor bottles. Can you imagine being on a trip and receiving these cuties with you in-flight cocktail? I started collecting these houses years ago – at vintage shops or thrift stores. My rule is I never pay more that $5 for one in excellent condition. 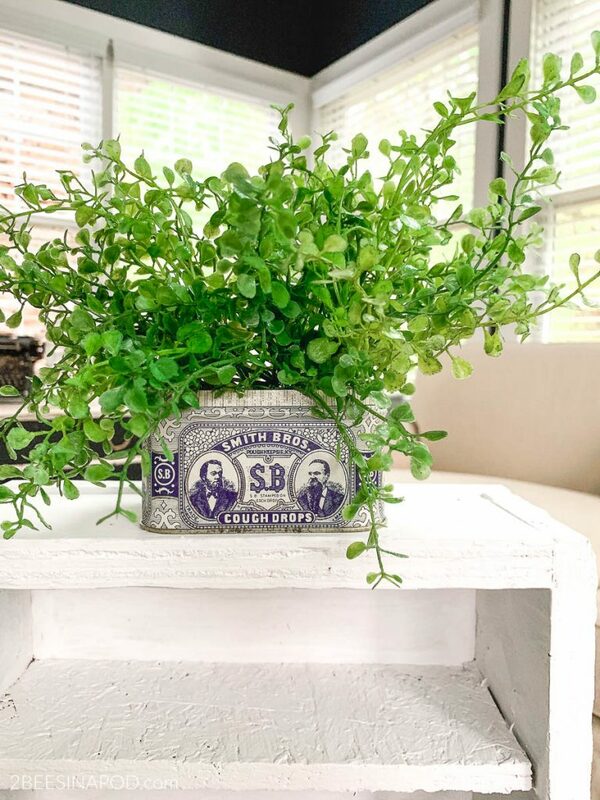 A couple of weeks ago I shared this project Easy DIY Vintage Tin Planter – Using a Smith Brothers Cough Drop Tin. Blue and white is such a clean and classic look. Not just in my home decor, but the collectibles too. 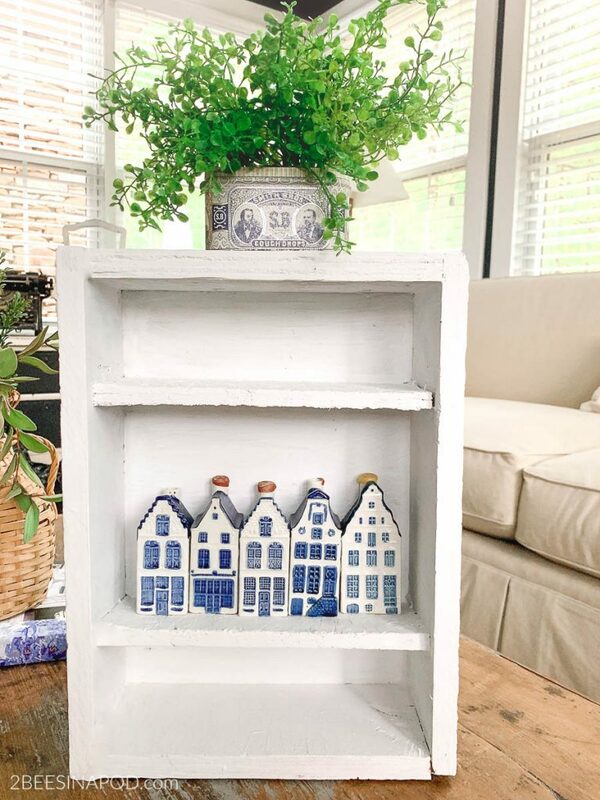 All-in-all I love how this painted shelf makeover turned out. It’s not an ugly duckling anymore. Plus this was a totally free-to-me project as I had the paint in my stash. It’s the same paint that I used on the Aged Terracotta Pots, Painted Trays with French Graphics and the Chalk Painted Books to Look Like Antiques With DIY Moulds. There is still plenty of paint for more creative ideas. 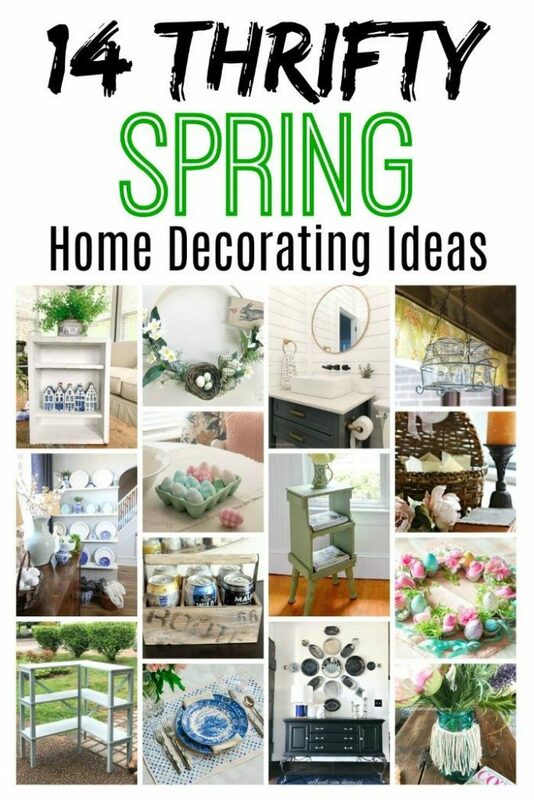 I hope that you’ve been inspired in some small way to make something for your home. 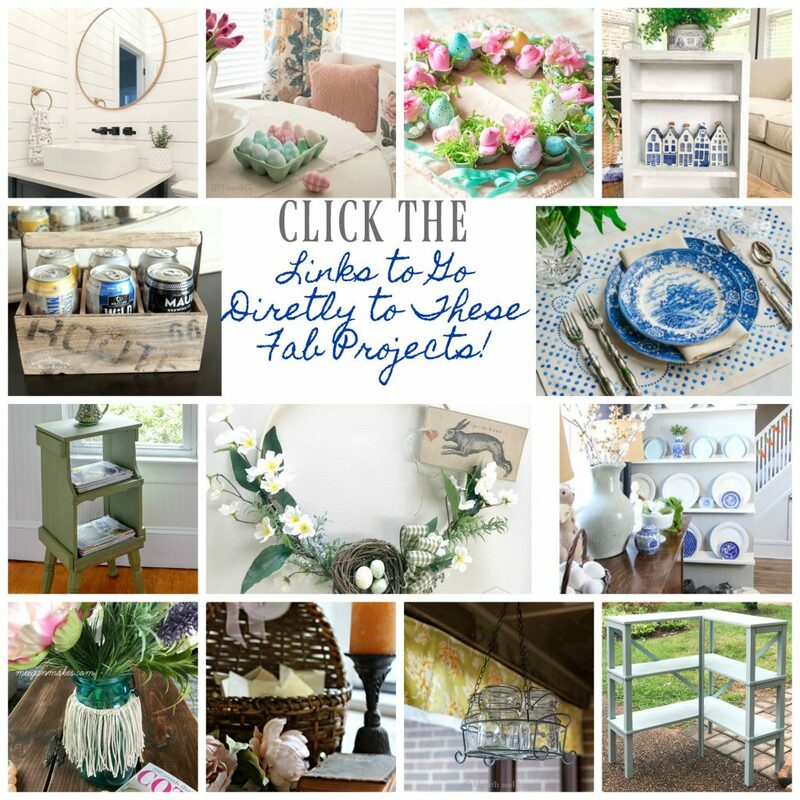 Remember, click the links below for more thrifty inspiration! Awesome free find! I would have overlooked this dirty piece. Heading to a thrift store today to look for crappy things that have hidden character! Thank you ladies for seeing possibilities in discarded stuff! 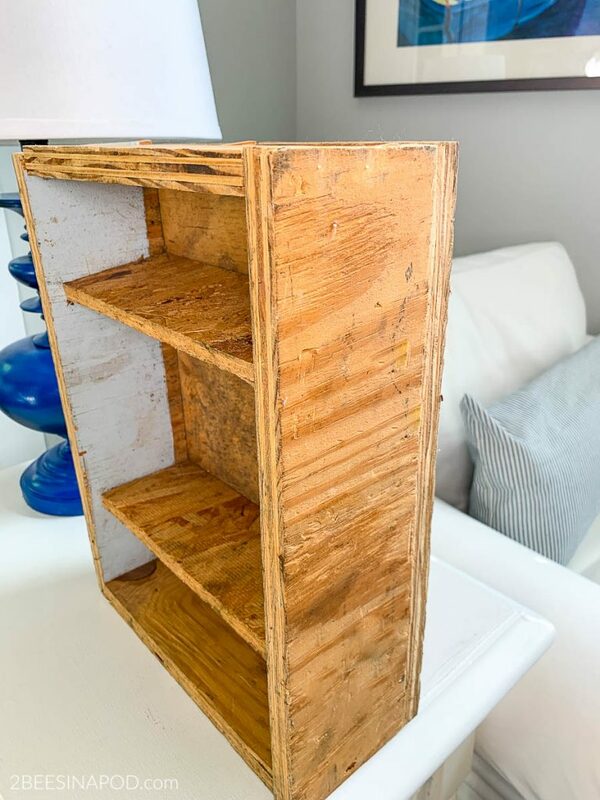 That was a rustic shelf before you gave it a new coat! The blue looks so pretty with the white, and I think I have the same tin in my collection. Pinned. Great find and makeover. I love those small units that you can tuck in here and there. A fresh coat of paint does wonders and now you have more room to store and display your stuff. I’m keeping my eyes peeled for something like this for my dining room. Mostly for storage but it doesn’t hurt for it to look pretty too, right? It always amazes me what a wonderful difference paint can make! Your “new” shelf is so pretty and definitely versatile. Ladies that definitely came out nicely. I love white on everything and I use that paint all the time! I love the idea of looking at “junk” like this and seeing it for what it could be! It really turned out to be cute! You have a great eye for transformations! Oh girl, how have I never heard about these little KLM liquor house bottles??? They are so incredible (you know my love of blue and white!) 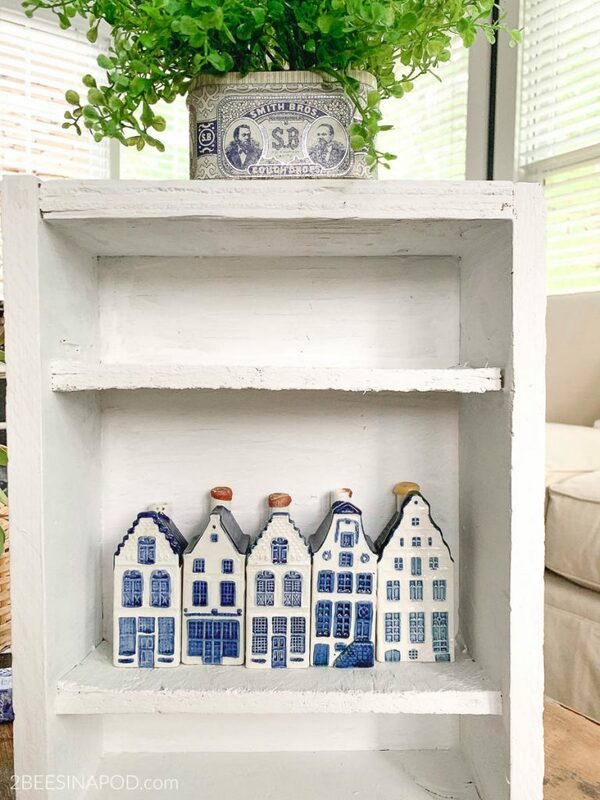 and I just adore them lined up in your painted cabinet! 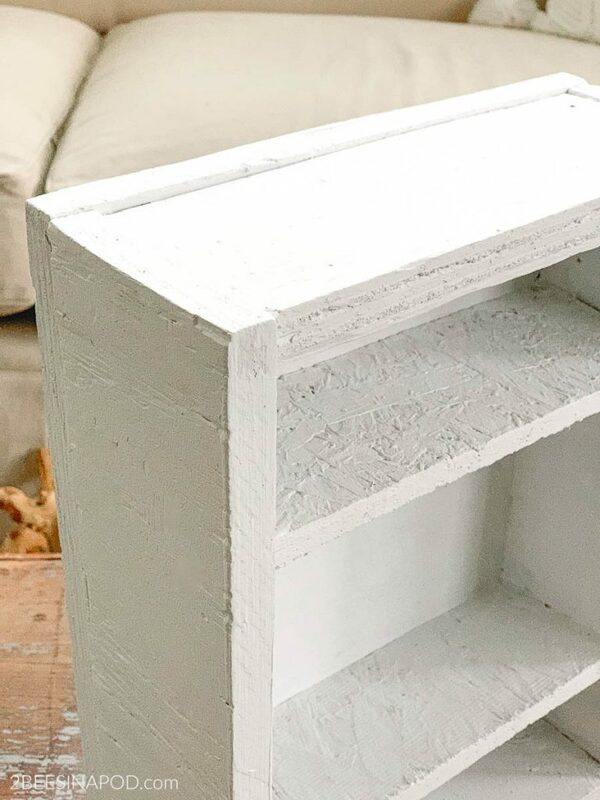 Funny story…I recently acquired a similar cabinet (roadside) and painted it white and was going to share this month!!! I love this rustic style. The touches of blue and white really pop! I love how you created a whole new look for this piece. Thanks for sharing your ideas and talent. I think I’ve been living under a rock because I was unaware of the little blue house liquor bottles! If I ever come across any, I will grab them! 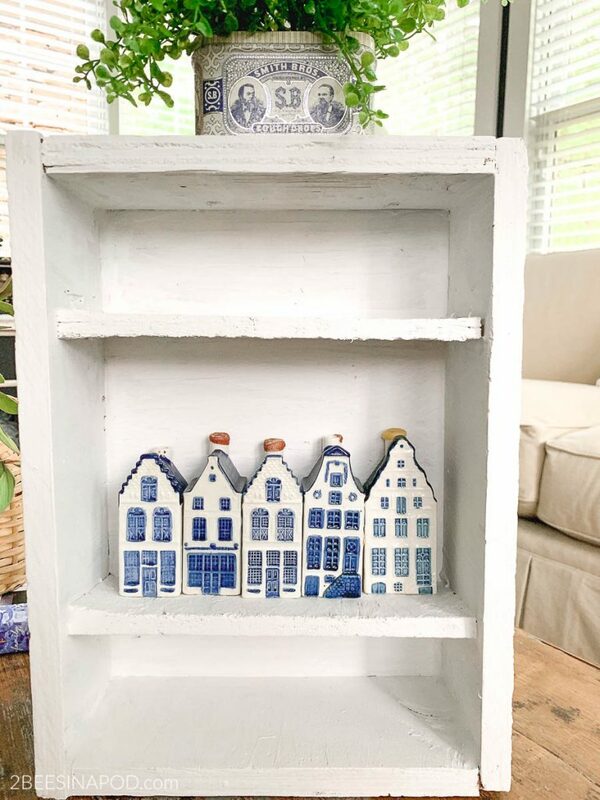 They look so fabulous in your made-over shelf!